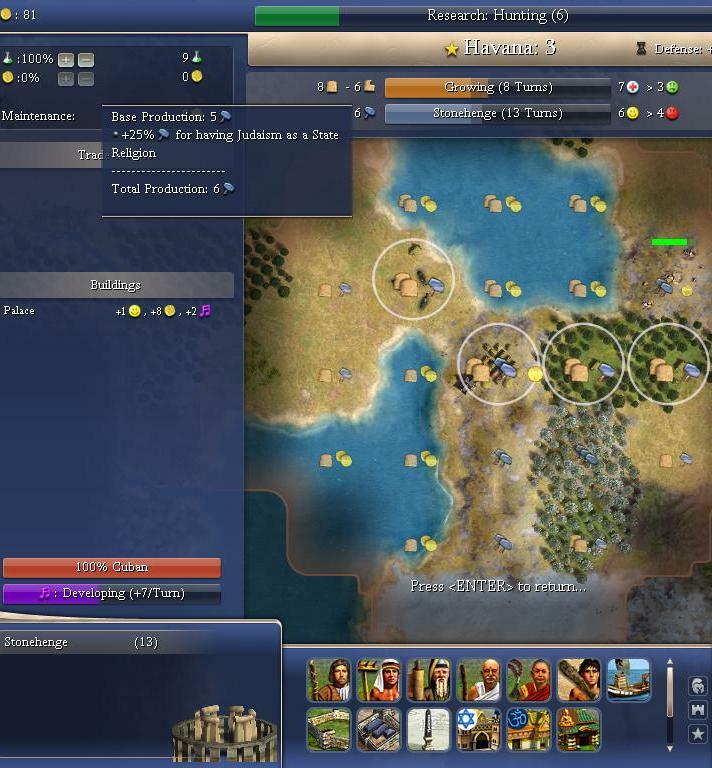 Discussion in 'Civ4 - Succession Games' started by Sirian, Oct 27, 2005. 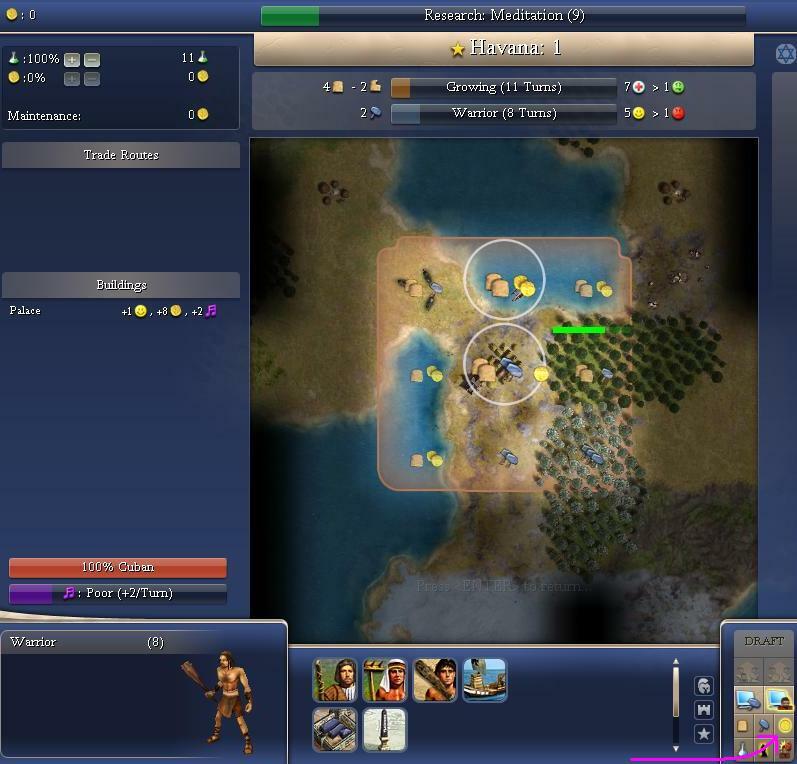 The new era dawns for RB Succession Gaming. Welcome. This game follows RB SG rules. Please see the main RB Discussion thread for details, or you can visit our site (linked in my signature). * Our ships may not leave culturally controlled waters. I got my copy first, so I get to go first. I see snow on the trees! YES! This is going to be a wheelbarrow's worth of fun. Cuban Isolationists was one of my favorite games of all times. I vote for a redux of that all the way! What civ would we take? Spain, perhaps? (With being so isolated... a religion would really be helpful.) I'd be fine with anyone except Saladin at the moment, since I just played out a long game with the Arabs for the Civ4 Walkthrough. "A religion would really be helpful," the man said. So... that is the initial goal: get some religion going! 4000BC: Havana founded. Research set to Meditation. We have started on a lake! This is not generally an impressive thing, but for a civ who begins the game with Fishing tech this can mean the option of eschewing early production in favor of extra commerce, to better compete in the Religion Race(TM). Mind you, the Religion Race is only one valid choice from among many. It's a good choice for Spain, though. Spain starts with Mysticism, and they start with Fishing, and if you start with Spain on a lake, you're just begging to go looking for god in all the right places. Note the pink arrow in the shot above. I press that button, informing the city governor that I want him to Emphasize Commerce. He moves the worked plot to the lake, and now we're ready to rock. I order that a second warrior unit be trained, then send the first one out scouting (it's safe, for a LITTLE while at least, to leave the home city undefended). The game's afoot! 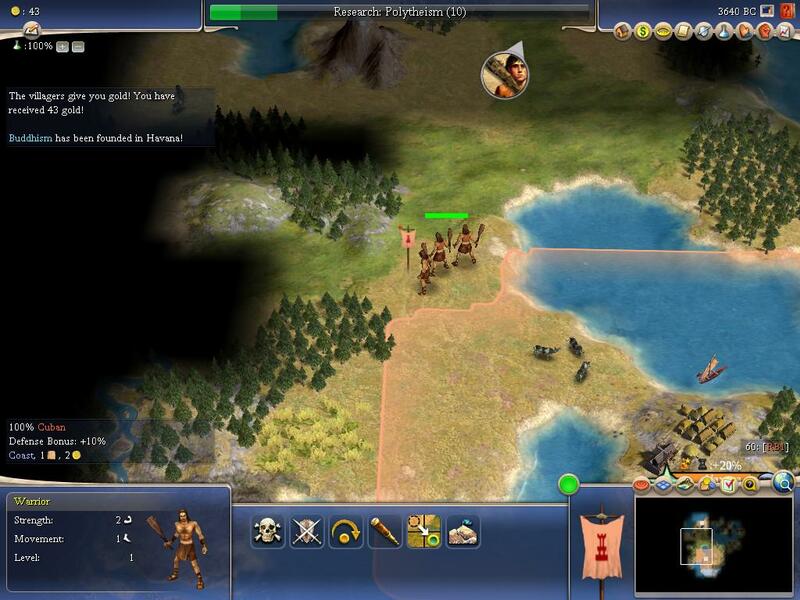 3960BC: Our warriors enter the tribal village northeast of Havana. "Civ3 Lingo Translation"(TM): I popped a hut. The locals share with us their knowledge of the entire region. 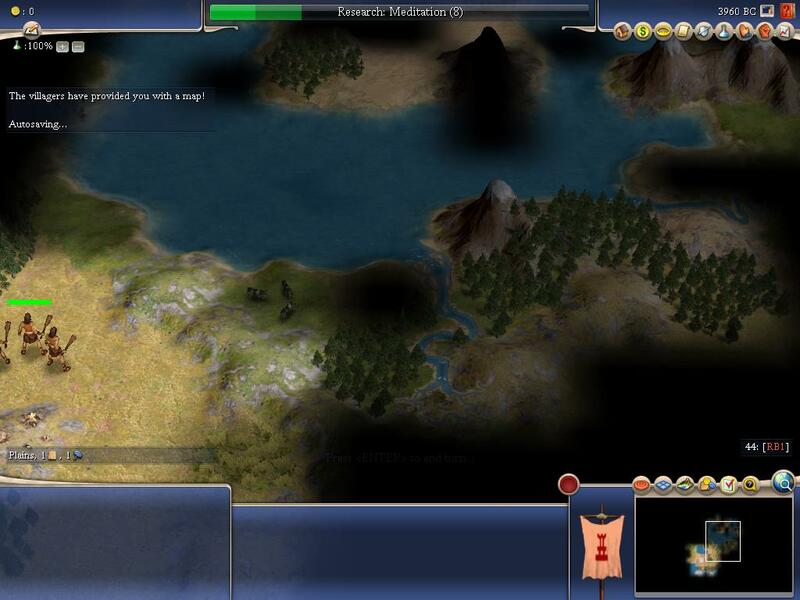 "Civ3 Lingo Translation"(TM): The dice roll gave us map info. Hmm. That is a salt water body (lakes give out extra food). It could be an inland sea, though. Custom Continents maps do some wild things with land forms. It could also be a large gulf. Need to do more exploring! ~3950-3700BC: Our warriors explore to the northwest. Our warriors turn northeastward (a right turn) and follow the coast. 3680BC: Our second division of warriors have been trained! I send them northwestward, toward the other trival village near Havana. Now this is where the strategy starts to get interesting. I have Buddhism locked up. However, we know of no landscaping techs! If I train workers, they cannot farm, cannot mine, cannot road. All they could do is stand around twiddling their thumbs! This is not particularly desirable when, while training, the city won't grow! A: More religion and delay workers, leaving Havana unimproved for centuries! C: Stop after one religion and research some economic techs. Spain on a lake is a perfect storm. I must "Chase the Hydra"(TM)! ...it means a long run doing something else. Oh boy. Buckle up. This is going to be a wild ride! I order Havana to begin construction of a great stone temple. ...we can plant our roots more deeply and begin to farm the earth! But first I must prove to them that the sun is as faithful as the moon! 3640BC: The first head of the dreaded beast has made its presence known! The friendly villagers near Havana contribute their wealth to our cause! 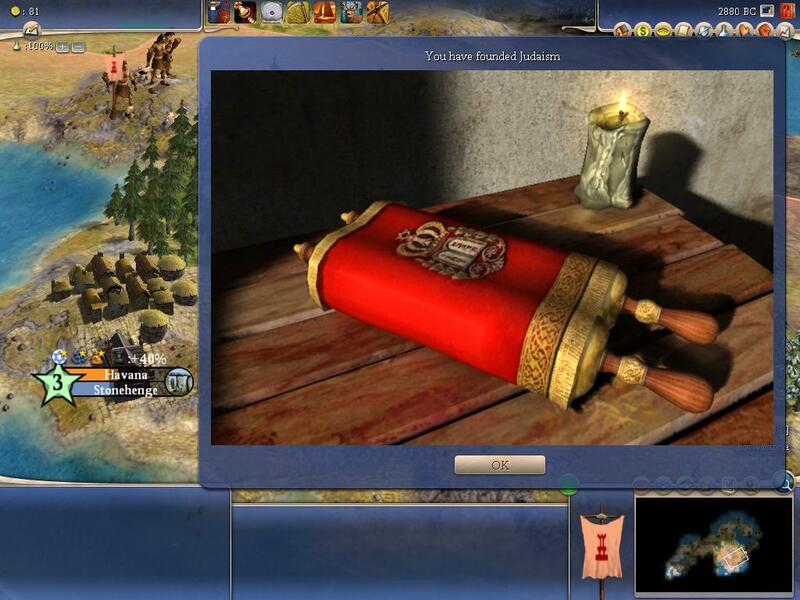 "Civ3 Lingo Translation"(TM): I popped a hut, we got some gold. Our mystics begin further studies in to the lore of the great Hydra. 3520BC: We discover that a large peninsula (a cape, really) lies to our north. My gut told me, "Go look anyway, or you'll miss a hut!" Soren's motto: Sometimes it's better to be good than lucky! Our other warriors are exploring westward. We have found a Stone source! Bad News Bears(TM), baby. Please-please-please don't come toward me! Oh, and uh... the villagers contributed wealth to our empire. 3400BC: Praise be to Buddha! THE BEARS STAYED AWAY! Sirian's motto: Sometimes it's better to be lucky than good. 3360BC: Our westward-moving warriors enter a hut in the desert. Masonry is a prerequisite for Monotheism! OK I have to pause here and plead my case. I did not rig this! 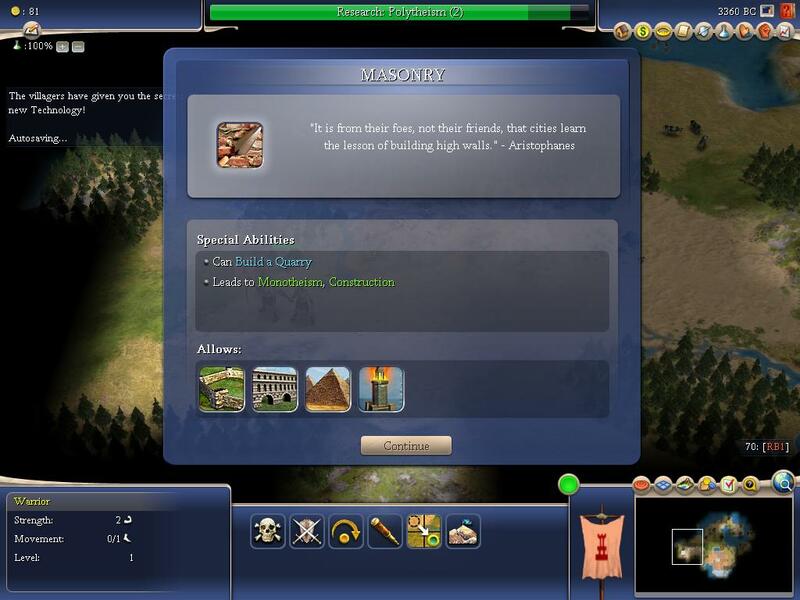 Soren did not put an easter egg in the code: "If Sirian's First Game..."
(Civ4's motto): Sometimes it's better to be lucky -and- good. This clears the way for a straight and early beeline to the Hydra's Cave. 3280BC: The second terrifying hydra head appears: Hinduism founded! 3240BC: "We're all singing Copa Cabana!" Yes yes, the capital is wide open. We are recalling our first division of warriors, do not panic. Envoys of the alien "English" made their presence known recently. 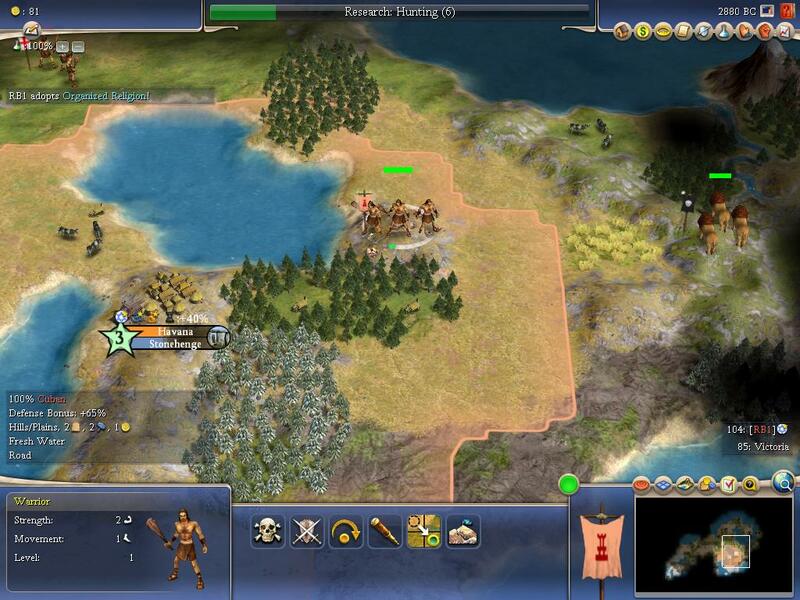 324BC: Now our scouts have found the homeland of these unenlightened barbarians. Perhaps if they bask in our greatness for a while, some of it will rub off on them! 2920BC: All of Cuba braces for the Beast's great awakening. Please direct your attention to the Emphasize Commerce button. Note that I have clicked it again, telling the governor to stop working the lake. Our glorious servant complies, switching back to "normal" production, shown above. Mind you, the governor's not a genius! He is not without shortcomings. However, we sent him to school, and he is no longer a drunken fool! I actually trust the governors to run most day to day affairs. But, I will still micromanage a city. ... ... Now and then. Shield production (I still call them shields! SUE ME!) is up to 5spt! All hail the mighty beast! The mythical monster awakens! BEHOLD!!! The three-headed hydra resides now in the city of Havana. Look upon her... The dreaded HinBudJewIsm the Magnificent! ...and despair. Cuba has tamed the Hydra. Great so far ! As by magic, and as you fainted to point out, everything seems to fall into place in this first game already : you're going on the faith ride, and both your skills and luck are on your side. I agree, it's better to be lucky AND good. How many turns in a row will each of you play ? - You say you haven't founded a state religion yet, does this mean you can "stock" religions and reserve them for later ? - Does it also mean that only you will be able to found Buddhism for the whole game, or can another civ found it too, once the tech is discovered, if you haven't founded it yet ? - Can you only have one state religion at a time, and is this why you didn't found Buddhism ? - If I understand the PDF tech tree correctly, you have to get both Polytheism (on its way) and Masonry before starting research on Monotheism, is that right ? - I'm surprised by the fact that you didn't start the game by getting 3 hammers per turn, so as to build the warrior in 5 turns ; is this usually good to delay production in order to win the religion race or other things, or is this just the fact that we're in special territory here (RB SG weird variant) ? Keep up the good stuff. Sullla and yourself are the two guys making the real show at the moment. Being Spiritual means "no anarchy". This means "free" changes of religion or civics, on demand. Only one caveat: can't change again for five turns. This gives us the chance to pick a religion now, and switch to Organized Religion civic, at no cost. If I picked "the wrong one" and a different one spreads to the English (or to our later cities) we can switch again later at no cost. Heck, we can even switch JUST TO REVEAL PARTS OF THE MAP, because our state religion will reveal cities that have that religion, if we control the holy city. (Might cost us a bit to do "religion scouting" -- it is NOT something you see commonly -- but it may be of use to some crazy Cuban Isolationist wackos. With Organized Religion now in effect, we get a production boost on buildings! If we can get that Stone hooked up at some point, we could be advantaged toward building some more wonders! Of course, we have to learn how to build ROADS first. 2880BC: I have set our tech path on the course of Hunting and Animal Husbandry, so we can rustle up some of those Sacred Cows. (If only Charis were here...!) We should be mindful of grabbing Archery soonish, too. I may have slacked on early military, but that only lasts so long before it will come back and bite you. 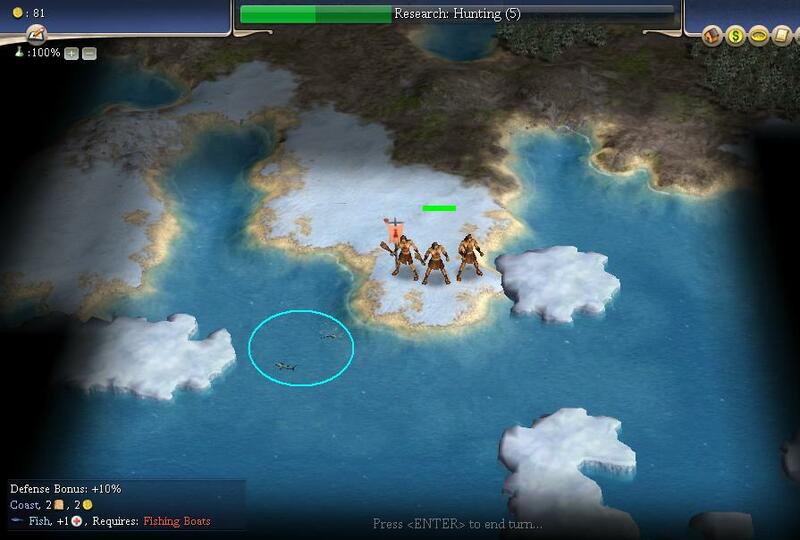 The fish are much easier to see when animated than in a still shot. 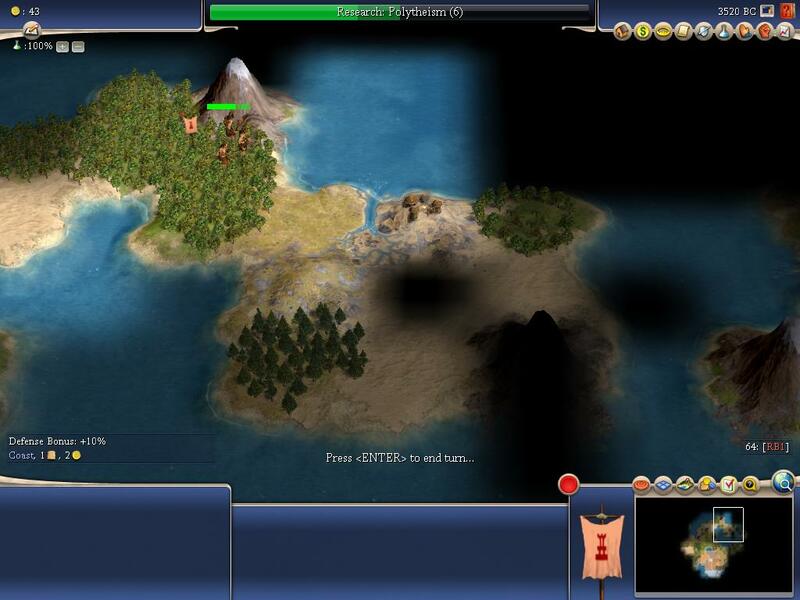 Really, that's the whole story of Civ4 graphics. It all looks MUCH better when animated! Well, OK, the English may get to some of this first. Still...! Yet another reason why I chased the Three-Headed Hydra(TM). We are Expansive civ trait! We have FOOD GALORE around! So we will use lots of religion to make our people happier! Perhaps, if they keep their distance appropriately, we will even (gasp) trade with the English. Some day. You knew I had to make some kind of dotmap, right? ... Right? Sulla... If we could get there first, and back it up with some archers before too long... Pink Dot would be a steal. One more city after that, west of Havana, and our permanently closed borders would require the English to attack us to plant their heathen cities anywhere east of our continent-spanning border! Civ4-style blockade, baby, yeah. Sulla will play twenty, and then we'll be past the "moves quickly" opening turns and settle in to 10-turn rhythm. Oh, and the dotmap above... I drew the city proposal in MS Paint, but the cultural borders are a map overlay when using the Tactical Map (aka "Globe View"). 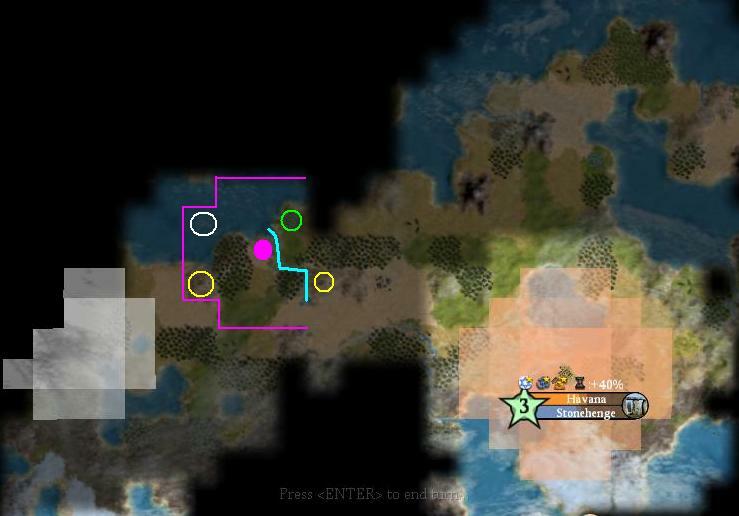 It's not -exactly- like Civ1's F10 world map. Actually... it's better! Ten. Our tradition has been to "equalize" things in the opening, though, because the first turns go by so quickly, that playing thirty to start is like playing ten in the middle of the game. Or thereabouts. It will become clear quickly when you see it in the game. You can choose to set your STATE religion as any religion that exists in any of your cities! This is true whether or not you control the holy city. As of the end of my turn, the three religions would appear to be equal. They all exist only in Havana! It's founded. In Havana. It will spread (via trade routes: roads, rivers, rails, coastal water post-Sailing, oceans post-Astronomy) on its own to additional cities. If it spreads to an AI, they can then choose (or not) to switch to that as their state religion. If a different one spreads to them first, they will go with that one instead. They may switch more than once -- for various reasons. You just have to play with it a bit, and it will all come clear. Yes, and no. Why I waited to found a state religion... Well, I don't want to spill the beans on everything. Not trying to be stingy! It's a new game, though, and a really fun one to explore, so some things are best left unexplained for the time being. (It's a minor point anyway). Yes. Must have been Destiny that I popped it from the hut. Truly! The odds were like one in ten or something thereabouts. is this usually good to delay production in order to win the religion race or other things, or is this just the fact that we're in special territory here (RB SG weird variant) ? OK, now I have a problem. It's taking Sulla too long to take his turn! "Each time the city grew" = all the time, I hope ? Not just on the turn the city grows, like in Civ3 (to get a few more coins) ? I'd prefer not to have the system leading to the latter, because that'd mean more unnecessary MM, and illogical MM processing. Not sure if you want to go a little off-topic here, but if you want to tell us how ITs are processed, just shoot. I like the sound of techs being the holdup, which was rare in Civ3 (where you usually got techs without the real need to use them at first). It leads to getting gold instead of hammers : MM yes, but better MM ! Awesome ! "Each time the city grew" = all the time, I hope ? You can see the lake plots are worth 2/0/2 and the forests and Cow are worth 2/1/0. Using the lakes meant giving up the 1 shield for the two commerce, and this was being done for ONE pop point when the city was size 1. When it grew to size 2, it was happening for TWO pop points working the lake instead of the normal "production oriented" plots. I hope that clears it up. If by "MM" you mean MACROmanagement, then you're spot on. If you mean MicroManagement, though... Well, I only clicked twice. Once to set commerce emphasis, then a second time to shut that off and go back to normal (more shields). Two clicks... in thirty turns. I didn't have to babysit it when the city grew, nor check on it over and over, worried that it would "waste" something I could save by being zealous. Two clicks. Nothing wasted: not my time, not the city's production, nothing. Better game rules plus better AI delivers much better performance from the automation. I knew that I was going all the way to Monotheism when I saw the lake, so the commerce thing was a long term deal, a STRATEGIC choice (in my mind). That's not MM in my book. Though I do use some real MM sometimes. You can Micro as much as you please. Vets will take a while to warm to the governor. Some never will, but many will be relieved of significant tedium. OK, that clears it up for the 6 gpt, I can see them in that other city screen pic. I meant micro... No big deal, as I think that those 2 clicks are where macro and micro get mixed together : they're the keys to your initial strategy (macro), but they perform a task related to managing the citizens in a city (local or micro). The fact that it can be seen as both is because you only have one city at this point, making a slight change a great one. But if the pure babysitting is gone, then fine ; I make a difference between (intelligent) micro and babysitting. Intelligent micro is eg. when you profit from a food surplus to create a specialist (without re-inventing your global strategy (not the case here, as working the lake directly lead to the Three-Headed Hydra strategy)), whereas babysitting is eg. when you work a gold tile instead of a shield tile on the turn the city grows (Civ3, and I hope it's gone). Now, where is Sullla ? Spread that virus to foreign land ! Sirian, could you please explain a bit more about the hydra strategy: it appears to me (and i didn't get the game yet, so i'm propably wrong ) that 2 extra religions don't give any real benefit. As i uderstand it, you can only have one state religion, so if you founded 3 religions then some of your citizens will become unhappy because they would have a different religion, is that true? Also if you want to convert your neighbours, you can only use missionaries of your state religion, is that right? It looks like there is an important early choice whether to beeline to a religion tech or research worker techs early on (hoping to get a later religion such as christianity or islam). I think i have to play the game a bit to see how important getting religion earlier is, but from my current civ3 point of view sacrificing early growth to get a religion looks very weird. Just like building wonders with only 1 city (You aren't playing OCC, right? ). And also something i wanted to ask for a long time (about micro ): How much food it required to grow in size? It seems like this number depends on population, is that right? Not to speak for Sirian, and I don't have the game myself to know for sure, but I believe that the "religious shrines" for each religion can only be built in the holy city for said religion. Here's where the guess-work comes in.. I don't know if you can build more than one 'shrine' in each city, but if a city can be the holy city for more than one religion, I don't see why more than one shrine can't be built. This would mean that for every religion founded in that city (or empire if mroe than one holy city is owned) and every shrine built, the holy city controlling civ would gain +1 gpt for every city that has that religion in it. I'd asume with three religions founded, and three shrines built that could mean a lot of potential gpt down the road, if my understanding is correct since I have yet to actually get to play. Now one question I just thought of is this: let's say that all three shrines were built in Havana (again, assuming such a thing could be done), and a foreign city has all three of the religions in it, would Havana get 3 gpt from that single foreign city? If so.. Wow! That could be a flood of gold in the late game if cities have the religions scattered all over the world and some civ controlled most, or all (hard to do I'd imagine on higher difficulties) of the holy cities int he game. Oh man, we're already off to a variant start here! 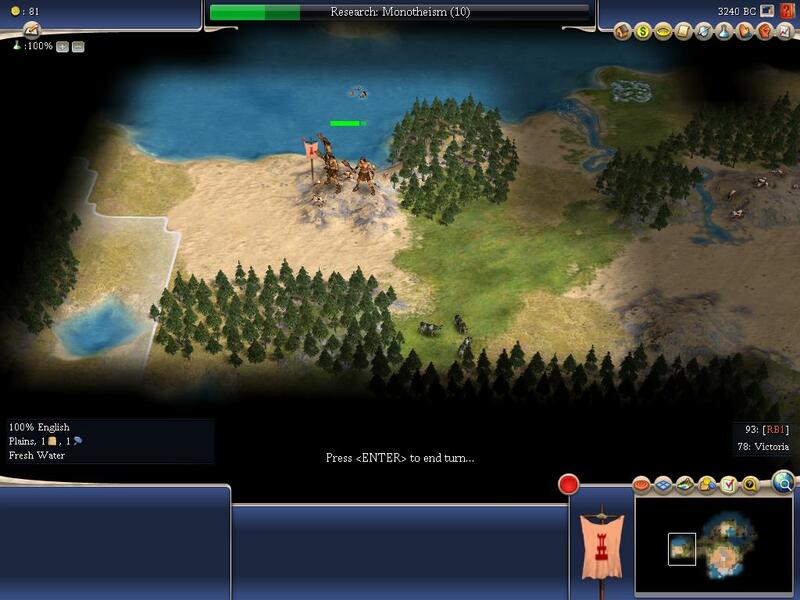 Those of you who haven't played much Civ4 won't see this right away, but Sirian is taking us on a WILD ride here. Worker techs? Bah, we don't need no steenking worker techs! Masonry... That's THE tech needed to go straight for Judaism after getting Hinduism! We're going to RUN THE TABLE on the early religions here! BudHinJew the Magnificent! Oooh, NOT alone on an island. This could get interesting. Bah! Speak not of such unpleasantries to us Cuban Isolationists! Can't you see us building a socialist utopia here? Enough religion so that each population point in Havana can have their own faith! That *IS* nice land there. A good mix of health and food resources too. And enough ice for the Cubans to make Charis proud! That *WOULD* be an incredible site for a city. I don't think we have a prayer in the world of getting it, since we've been off in crazy variant land with wonders and religions here, but it's possible! But of course! You are talking about the socialist paradise of equality, si! Well, excuse me. How long did we have to wait for you to finish your turns in all those MP games, eh? I still don't have a copy of Civ4. I'll see if I can track one down tonight though. Hey, I'm not the one posting at 4am buddy! We are off to an absolutely CRAZY start here. 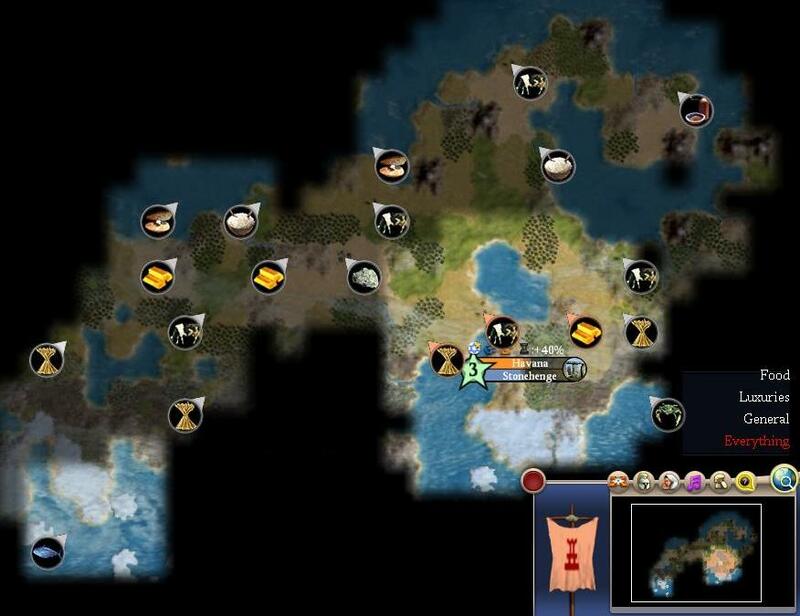 I don't think anyone will be able to see that until they play more of Civ4 and come back to re-read this game, but this is the most unorthodox start to a game of Civ4 I have ever seen. I have no clue what's going to happen next, but this promises to be great fun. I think I see part of Sirian's plan (I may have some questions to ask via email), especially the building of a temple and Stonehenge. Going for a certain type of Great Person, perhaps? I'll see what I can do. That is, when I get a copy of Civ4! Sirian you're such a nut. I don't think you slept last night. I'm starting to sense a trend between Sullla's game and this one. 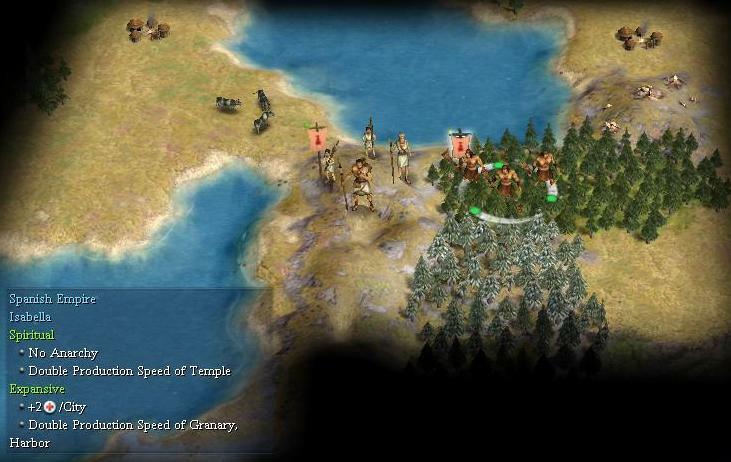 As ag is overpowering in Civ3 it appears that religion and culture is in Civ4. Growth is power through religion is my impression. Is it possible to not research a early religion early game? Sirian, could you please explain a bit more about the hydra strategy: it appears to me (and i didn't get the game yet, so i'm propably wrong ) that 2 extra religions don't give any real benefit. You can only have one state religion at a time, yes. You can change from one to another, though. You have to burn a turn to do it (go through anarchy) unless you are playing a Spiritual leader. (Isabella is Spiritual!) Thus players in most games will choose a religion, go through the anarchy once, and never switch again. Or maybe they will switch a second time if an important AI asks them to do so (and they really -need- that relationship to prosper). Religious civics only work for your state religion, so if you have Religion A in all your cities and Religion B in only half your cities, switching from A to B is a handicap. But there is more to it than that. This game is a variant. Variants involve adding EXTRA, VOLUNTARY restrictions to increase challenge or experience variety, or both. There are three simple variant rules on this game (listed in the first post) but though simple, also far-reaching. Please don't mistake my actions as a blueprint for how to play a normal game. Believe me, World Wonder BEFORE Worker or Settler is not the standard move. Sulla and I are ready for a variant game. We are well familiar with the core game already (having been working on it). I honestly would not recommend jumping in to variants right away. Think of this more as entertainment than anything else. 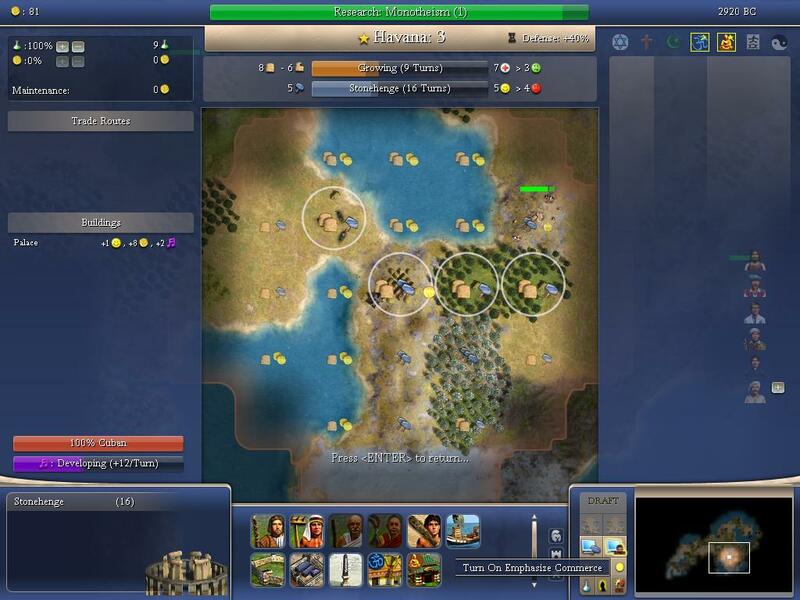 I hope to inspire folks to want to play Civ4, just as I wanted to inspire folks to play Civ3. 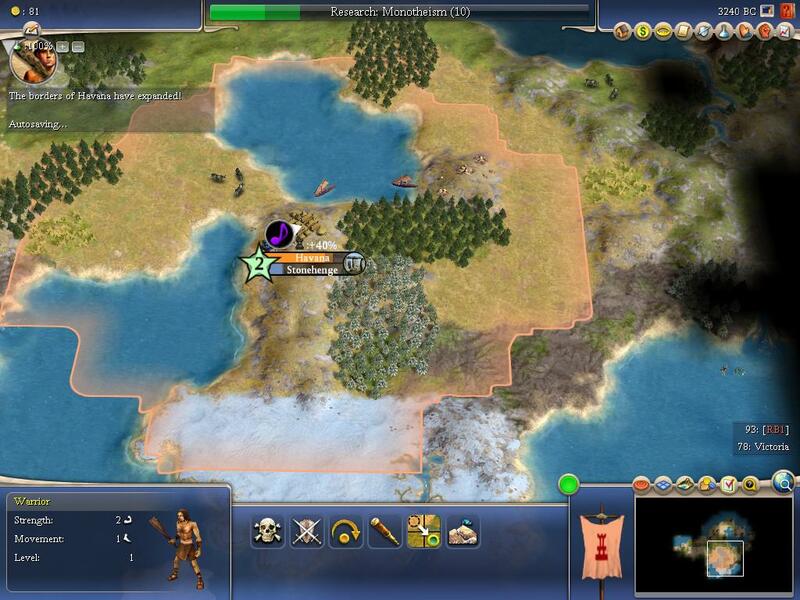 I finally get to goof off and PLAY Civ4 and so it is going to be very very goofy indeed. if you founded 3 religions then some of your citizens will become unhappy because they would have a different religion, is that true? If having more than one religion actually PENALIZED YOU across the board, then it would automatically be foolish to take on extra penalties. Religions clash from one civ to the next, but not within your own borders. You can safely found multiple religions. Clearly the state religion is far and away of the most value, but the extras can be worth obtaining... if you don't lose out on too many other things to get there. (You can also chase them and NOT get them -- they are very much a new form of World Wonder in this regard). Delaying workers or settlers for as long as I have... That will slow down our expansion in terms of extra cities. Everything comes with a cost. Also if you want to convert your neighbours, you can only use missionaries of your state religion, is that right? No. You can use a missionary of any religion that exists in one of your cities. You can only build a missionary of X type in a city with Religion X present. It looks like there is an important early choice whether to beeline to a religion tech or research worker techs early on (hoping to get a later religion such as christianity or islam). There are indeed important early choices to make. Civ4 is very much a "Play the Hand You Are Dealt" kind of game. Your leader's traits, your land, available resources, number and proximity of neighbors, and how the religions shake out, are all factors to be weighed in building (and sometimes altering, in progress) your opening strategy. How much food it required to grow in size? It seems like this number depends on population, is that right? Yes, uh... well... I had to stop at thirty turns, and so "one more turn" got replaced with "one more screenshot". Not only is it possible, it is often essential. My last win on Immortal difficulty, I ignored the entire religious tech branch in the opening, NEVER had a state religion all game long, did not have any religion at all until some spread across the oceans to me in the Rennaissance Era, then adopted Free Religion and spread several of the AI-founded religions around to my larger cities (boosting the AI civs' shrine income!) for the extra happiness. Chasing early religion means NOT chasing other things early. Anybody who concludes that there's One Right Answer(TM) for the opening is mistaken. A given map may indeed have one approach that would work best (as we will see when the SP tourneys get cranking) but the same strat that whips Map A might flounder completely on Map B. 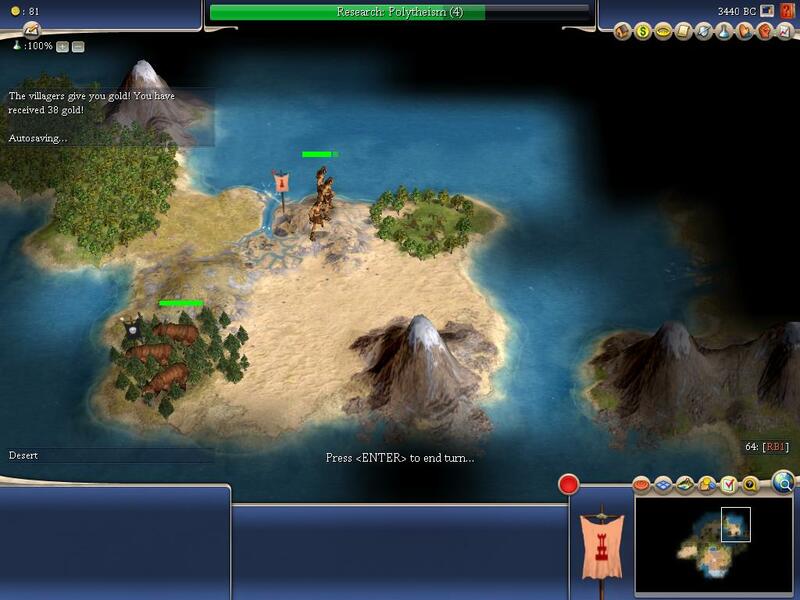 This is not Civ3, guys. I know that's going to take a little while to really sink in. You have to play it to understand. ... This game is balanced! There are many paths to success. Play the hand you are dealt! Are you sure about this Sirian? I don't (yet) have the game but this means a city will grow from size 1 to 2 in 2 turns which seems a bit quick.